I’ve got a bunch of Halloween Cuties just sitting in my fridge, so of course my kids check the lunch menus and proclaim that the rest of the week consists of school lunches they actually like. Figures. 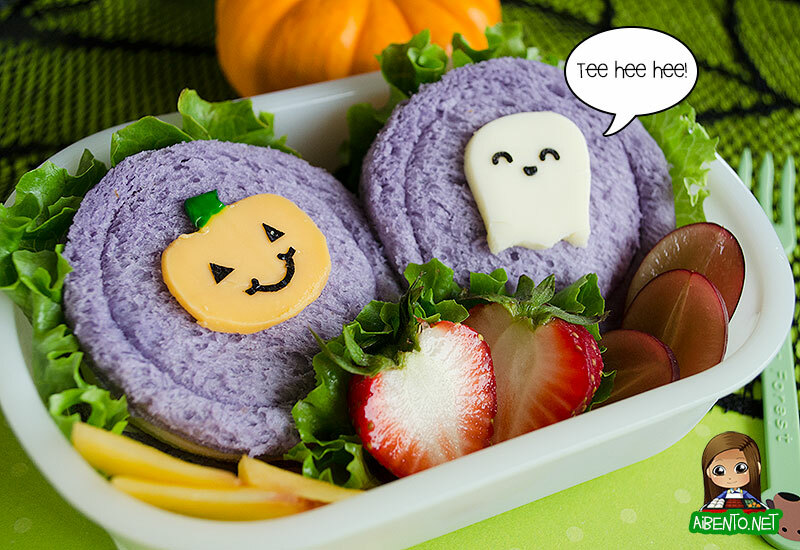 I went grocery shopping yesterday and actually found purple taro bread, which is perfect for Halloween, so I was thrilled. For local people reading my blog, I got this at Foodland. 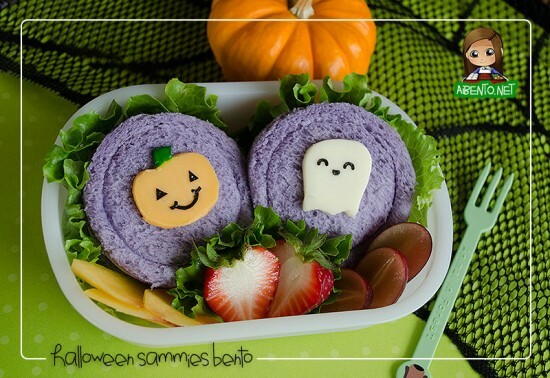 It’s the Bale Japanese taro bread. If you have a bread machine, you can simply add food coloring to your favorite white bread recipe. I’ve done this to make pink bread before, and it’s really easy. Anyway, without anyone to make this for, I decided to make a snack bento for Mikia after school, since she’s getting to be the age where she’s constantly hungry and all I hear after school is, “Can I eat this?” or “I’m hungry, when’s dinner?” At 3 pm. Since it’s for her, I used two of her characters, the pumpkin and giggling ghost. Next to them, I added slices of peach, a cut strawberry, and some grapes. The lettuce is meant to be torn apart and stuck into the sammies. To cut the sandwiches I used my Ateco cookie cutter set, which has eleven sizes of circles. I chose one that was two sizes smaller to imprint the inner circle. I haven’t done that before, but a border seemed like it would look better. I moistened the cutter before pressing it down, but I didn’t cut all the way through.